Lipids in the brain, often concentrated in cell membranes, block light from reaching the intricate structures that comprise the organ, which is the body’s master controller. By removing these fats, it is possible to move ahead with desired imaging studies. 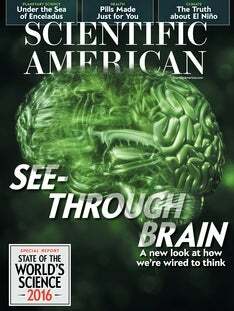 Watch Karl Deisseroth of Stanford University, author of “A Look Inside the Brain” in the October Scientific American, doing just that, as he describes his work on making brain tissue transparent.